“In a binary star system, the star can interact with the companion during its evolution. When a massive star evolves, it swells to become a red supergiant star, and the presence of a companion star may disrupt the outer layers of this supergiant star, which is rich in hydrogen. Therefore, binary interaction may remove the hydrogen layer of the evolved star either partially or completely,” says Postdoctoral Researcher Hanindyo Kuncarayakti from the Department of Physics and Astronomy at the University of Turku in Finland and the Finnish Centre for Astronomy with ESO. Kuncarayakti is a member of the researcher team that made the observations. “However, the companion star does not have a significant role in what happens to the exploding star’s helium layer. Instead, stellar winds play a key role in the process as their intensity is dependent on the star’s own initial mass. According to theoretical models and our observations, the effects of stellar winds on the mass loss of the exploding star are significant only for stars above a certain mass range,” says Kuncarayakti. “By observing stars dying as supernovae and the phenomena within, we can improve our understanding on massive star evolution. 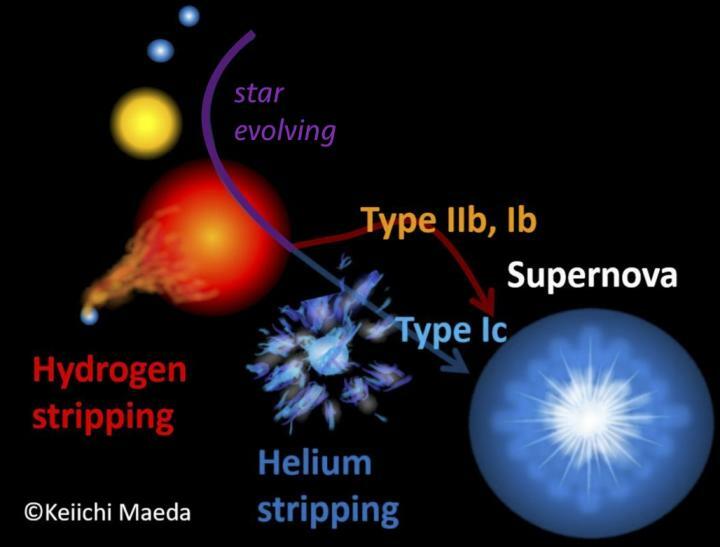 However, our understanding of massive star evolution is still far from complete,” states Professor Seppo Mattila from the Department of Physics and Astronomy at the University of Turku.